The order Odonata contains the dragonflies and damselflies and is one of the most popular insect groups. Odonates are popular with both the amateur and professional because they are large, colorful, easily observable and have exceptionally charismatic behaviors. In recent years dragonflies in particular have been popular with birders as many dragonflies rival birds in wingspan, color, gregariousness, and predictability. As a result of their popularity with the public, they have become the focus of many conservation efforts in North America, Europe, and Asia. Odonata was until recently composed of three suborders: Anisoptera, commonly known as dragonflies; Zygoptera, commonly known as damselflies; and Anisozyoptera, as the name denotes, a morphological composite of the previous two suborders. However, the suborder Anisozygoptera has been abandoned, as current research shows that Anisozygoptera is not a natural group, and is paraphyletic (Rehn 2003, Lohman 1996). Thus, the group has been combined with the suborder Anisoptera, which does form a natural group in a new suborder called Epiprocta (Bechly 1996). To facilitate the discussion of North American odonates it is useful to use the names Zygoptera and Anisoptera when discussing differences between the damselflies and dragonflies, as there are no extant Anisozygoptera in North America. Dragonflies (Anisoptera) make up the more specious of the two suborders and are much more easily observed than their dainty relatives, the damselflies. They have large eyes that take up nearly the entire head surface and when not contiguous are not as widely separated as within the damselflies (see the key below). They also have a very robust body structure to support a massive musculature that propels their large, broad wings. Dragonflies are unmatched as fliers and have a very agile, deliberate flight. Males are often territorial, defending oviposition sites from other males. Figure 1. 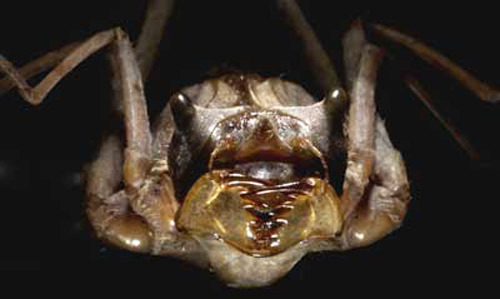 Dorsal view of an adult dragonfly from the family Libellulidae. Photograph by Seth Bybee, University of Florida. 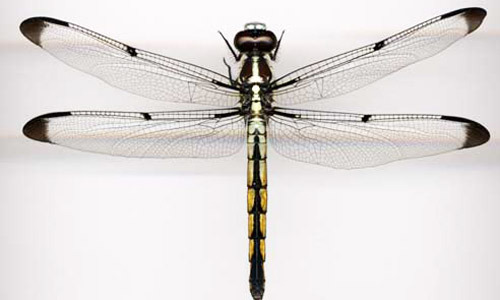 There are six families of dragonflies found in Florida, each of which is easily identifiable. These insects are commonly found around ponds and open bodies of fresh water and large blacktop parking lots (perhaps parking lots resemble open bodies of water to odonates where they search for prey and mates). There are a number of species that disperse away from water for a time before returning with a mate to breed and deposit eggs. Damselflies (Zygoptera) comprise the more morphologically diverse suborder of odonates. In North America and particularly in Florida they have similar characteristics, which are: eyes separated by more than the width of a single eye, abdomen much longer than wings, very slim body structure and a simple fluttering flight. Damselflies can often be quite spectacular in color such as the ebony jewelwing damselfly, Calopteryx maculata, found throughout the eastern United States and Florida wherever there are slow flowing, shaded wooded streams. Figure 2. Dorsal view of an adult Calopteryx maculata, a damselfly. The species is in the family Calopterygidae. This image shows one of two general wing forms found within damselflies in Florida. Photograph by Seth Bybee, University of Florida. Figure 3. Dorsal view of an adult damselfly from the family Coenagrionidae. 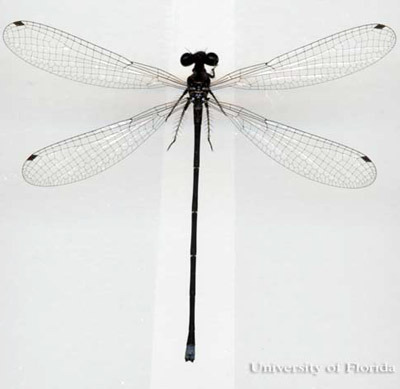 This image shows one of two general wing forms found within damselflies in Florida. Photograph by Seth Bybee, University of Florida. Away from the forest habitat one can find other families of damselflies. One of the most commonly encountered families is Coenagrionidae, which can be observed just about anywhere along the edges of water systems. A less common family of damselflies is Lestidae. This group is readily identifiable in the field by their behavior of perching with their wings held open, a characteristic more common to dragonflies than damselflies. Odonates are found on every continent except for Antarctica. In particular, the majority of the families that comprise Anisoptera are broadly distributed throughout the world. Some species of dragonfly have vast distributions such as the blue-eyed darner, Rhinoaeschna multicolor, which is found from coast to coast in North America, in addition to Central and South America. In contrast, many families of damselflies are narrowly restricted and several families have an extremely limited distribution. 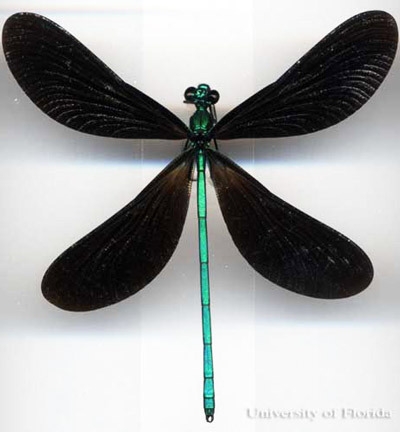 Florida is home to more than a 150 species of odonates belonging to three families of damselflies: Calopterygidae, Coenagionidae, and Lestidae (Daigle 1991) and six families of dragonflies: Aeshnidae, Cordulegastridae, Corduliidae, Gomphidae, Libellulidae, and Petaluridae (Daigle 1992). They can be seen near any body of water or running stream, often sitting in sunspots breaking through the forest canopy along a river or pond, or patrolling the water's edge. Some species can be found in open fields far away from water while searching for prey or while migrating. Eggs: Odonate eggs display a large array of shapes, from those that resemble tiny rice grains to minute mangos. Odonates oviposit in three ways: endophytic (within a plant), epiphytic (on the surface of the plant), and exophytic (on water or land, Corbet 1999). Generally, eggs oviposited endophytically are several times longer than wide while those laid epiphytically and exophytically are ellipsoidal to subspherical (Corbet 1999). Clutch sizes can be as large as 1500, with some females depositing several thousand eggs in a lifetime (Corbet 1999). Eggs hatch seven to eight days after oviposition but hatching can be postponed for up to 80 days (Miller 1992) and in one case 360 days (Sternberg 1990). Immature odonates (naiads): Immature odonates are sometimes referred to as larvae or nymphs, but here will be referred to as naiads because odonates are aquatic hemimetabolous (lacking a pupal stage) insects as immatures. Naiads live in most aquatic habitats. Some can even survive in salt water (Corbet 1999). All naiads are voracious predators feeding on everything from small invertebrates such as mosquito larvae to smaller vertebrates such as fish and frogs. Figure 4. Frontal view of a dragonfly naiad from the family Macromiidae. This image shows the general form of dragonfly naiads. Photograph by Seth Bybee, University of Florida. Figure 5. Dorsal view of a damselfly naiad from the family Calopterygidae. This image shows the general form of damselfly naiads. Photograph by Seth Bybee, University of Florida. 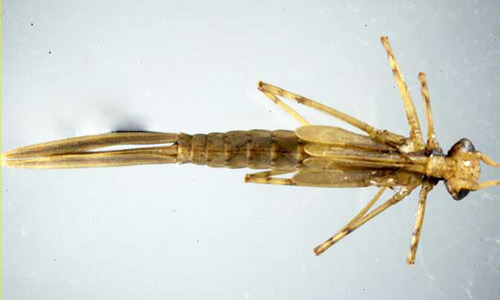 Naiads will molt nine to 17 times before becoming adults (Corbet 1999). The number of generations per year depends on the species of odonate. Species at higher altitudes or in dry environments usually have one generation per year while those in tropical habitats may undergo multiple generations per year depending on the availability of appropriate habitats. When naiads are ready for their final molt they leave the water and crawl onto the bank or vegetation where they will molt into adults. Much like a caterpillar emerging from a chrysalis, they need to pump up their wings and allow their bodies to harden before they can be effective fliers. A newly emerged odonate is teneral (soft). A teneral dragonfly has glossy wings and the colors on the body are often pale. Several days after emerging and hardening completely, a dragonfly will have taken on the colors of an adult dragonfly. Adults: Identifying males and females is not difficult. Males will have what appears to be a pouch on the second and third abdominal segments that contains secondary genitalia. The actual male genitalia are found on the last abdominal segments along with a grasping structure used to hold the female while mating. The male produces sperm at the tip of the abdomen and transfers this sperm to the secondary genitalia where the female will have access to it. Females do not have secondary genitalia or grasping structures at the end of the abdomen but instead have a single genital opening and a small ovipositor at the end of the abdomen that will be used to oviposit her eggs (see above for types of oviposition). Normally, the male dragonfly is more colorful while the female will be a dull brown or grey. This is not true for all odonates. For example, both sexes of Calopteryx maculata are very similar in coloration with the exception of the female having a white pterostigma while the male does not. When odonates mate they form what is called a "mating wheel." The wheel is formed when the male grasps the female behind the head and the female raises the tip of her abdomen forward to come in contact with the secondary genitalia of the male. Odonates can often be seen flying in tandem in this fashion. Anonymous. (2005). The Dragonfly Society of the Americas. (1 April 2015). Corbet PS. 1999. Dragonflies: Behavior and ecology of Odonata. Comstock Publishing Associates, Cornell University Press. Ithaca, New York. Daigle JJ. 1991. Florida damselflies (Zygoptera): A species key to the aquatic larval stages. State of Florida Department of Environmental Regulation. Technical Series. Vol. 11, Num. 1. Daigle JJ. 1992. Florida dragonflies (Anisoptera): A species kKey to the aquatic larval stages. State of Florida Department of Environmental Regulation. Technical Series. Vol. 12, Num. 1. Lohmann H. 1996. Das phylogenetische system der Anisoptera (Odonata). Deutsche Entomologische Zeitschrift 106: 209-266. Mauffray B. (2005). International Odonata Research Institute. (1 April 2015). Merritt RW, Cummins KW. 1996. An Introduction to the Aquatic Insects of North America (3ed). Kendall/Hunt Publishing Company. Dubuque, Iowa. Miller PL. 1992. The effects of oxygen lack on egg hatching in an Indian dragonfly, Potamarcha congener. Physiological Entomology 17: 68-72. Mitchell F, et al. (2012). Digital Dragonflies. Texas A&M AgriLife. http://agrilife.org/dragonfly/ (1 April 2015). Rehn AC. 2003. Phylogenetic analysis of higher-level relationships of Odonata. Systematic Entomology 28: 181-240. Sternberg K. 1990. Autökologie von sechs Libellenarten der Moore und Hochmoore des Schwarzwaldes und Ursachen ihrer Moorbindung. DrT, Albert-Ludwigs-University, Freiburg Germany. Westfall MJ, May ML. 1996. Damselflies of North America. Scientific Publishers, Gainesville, Florida. 649 pp. Publication Date: August 2005. Latest revision: April 2015. Reviewed: October 2018.